It was 1 of those rare Wednesdays where there were few new movies playing in theater but none of it was a major Hollywood movie. This was due to the fact that the one movie released in US was Fifty Shades Freed, the third movie of 50 Shades trilogy. And those movies certainly would not manage to get through the Indonesian censorship body. Never mind though, cause we got something else exciting enough playing in theaters yesterday. This was the movie that my wife and I saw at Plaza Semanggi. Since the plot was very well hidden and not too much shown anywhere, I would not provide too much detail except for few lines below. Conrad Travis (Ethan Hawke - Before Sunset, The Magnificent Seven etc) was some kind of a contract killer. He was given a new assignment by Jim Morrow (Paul Anderson - Sherlock Holmes: A Game of Shadows, The Revenant etc) which would affect an Interpol agent named Lin (Xu Qing - The Founding of a Republic, League of Gods etc). Jim Morrow was working for an evil organization called Red Mountain led by Wetzler (Liam Cunningham - Game of Thrones TV Series etc). It was during this assignment that Travis was killed and revived only for 24 hours. Travis has decided that he would use his last 24 hours to seek redemption. I believe that based on the brief synopsis above, you would get the picture of what kind of movie this was. My wife and I actually enjoyed this movie. The movie started brightly with few minutes of intense shootout, but later on it slowed down a bit for characters introduction. This was the part where the movie felt unclear of the direction. However, as the story goes, we got better understanding of the plot. And when the revival was done (yes, you read it right, it was a human's revival from the dead. So the movie had some science fiction in it), the movie pace became faster, filled with action pack sequences. When we saw the movie, the major thing that we focused on was the intensity of the action sequence and of course the cool fight scenes which this movie delivered. The high speed car chase in 1 of the city in South Africa was pretty good. (Fun fact: the car used for such scene was a Toyota Avanza which happened to be the type of car I am driving. So it was funny to see it being shot at multiple times, but of course only in a movie). The sound effects were amazing and really exciting. Basically my wife and I were pretty entertained with those action scenes. No surprise there since the movie was directed by Brian Smrz who previously worked as stunt coordinators for action movies such as Mission: Impossible II, Live Free or Die Hard and many more. Aside from the action sequence, the movie actually tried to give a moral message of what you would do if you only got 24 hours to live. In here, the person was trying to do something good in the last day of his life. But what would you yourself do? Now the science fiction element was probably not logical to some audience/critics, but heck if we want everything to be logical in movies, then we might as well stop watching it. 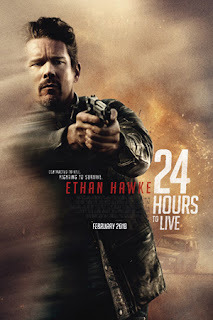 Ethan Hawke as the main protagonist was pretty awesome portraying a tired assassin. Liam Cunningham was quite convincing as the villain but personally I think Xu Qing's acting sometimes a bit unnatural, though she was good in the action sequence. There was a minor role played by Rutger Hauer (The Hitchhiker, Blade Runner etc) which was nice to see. Anyway, for audience who are looking for fun, and want to see some brutal shootout (some of them were shots in the head), then this is definitely worth the time to see. Be reminded that we go see such movie for entertaining purpose and not be amazed by mind blowing plot or the most intelligent conversations. It was a nice enough movie with a bit of science fiction taste. It is definitely not a movie for children due to those violence and brief adult scene (which was obviously cut by Indonesian censorship body). However, if you are looking for those high budget Hollywood action movies located in the beautiful location, then this might not be for you. The choice is yours.